Before the move to the main steps, make sure Node.js is installed and runnable correctly. Open the Terminal or Node command line then type this command. And this is the Node version that we use. Open your browser then go to `https://console.developers.google.com` address. Login using your Google account and you will be redirected to API dashboard. 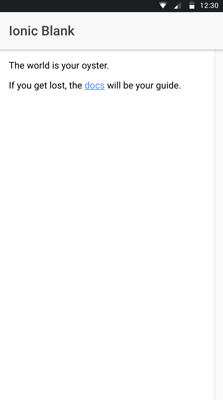 If you don't have a project yet, click the drop-down menu on the right side of Google APIs logo. Click the plus button to create a new project. 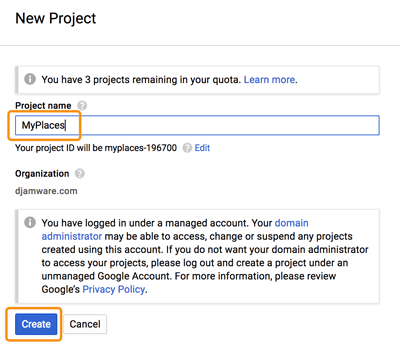 Fill the project name and click `Create` button. As you see, our Google APIs has reached maximum project, so we will use our existing project for this tutorial. After creating a new project, it will back to project dashboard. 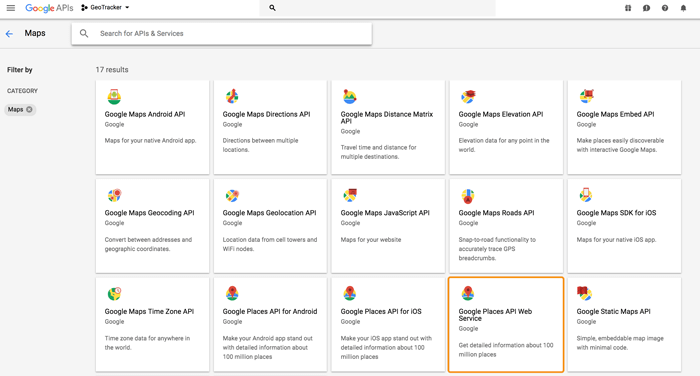 Click the `Enable APIs and Services` button then click `View All` in the Maps category. Find and click `Google Places API Web Service`. Choose `API Key` then it will create an API Key. Write down and save to your notepad or text editor for use later. To create a new Ionic 3 and Angular 5 app, in the terminal go to your Ionic projects folder then type this command. That command will create a new Ionic 3 and Angular 5 app with the name `ionic-places` and blank template (just Homepage). It also installing required NPM packages automatically. If there's a question like this. Just skip it by press `Enter` or `N` because we will primarily use the browser for testing. Next, go to the newly created app folder. As usual, for sanitation purpose run the Ionic 3 and Angular 5 app in the browser. If you see the Ionic 3 blank page in the browser like below, then you can move to the next steps. Replace `YOUR_API_KEY` with the Google API Key that you write to the Notepad in the previous step. Next, open and edit `src/pages/home/home.html` then replace all HTML tags with this. Open and edit `src/pages/home/home.scss` then replace all SCSS syntax with this. Next, open and edit `src/pages/home/home.ts` then add/replace this imports. Declare Google maps required variables before the class name and `@Component`. Add this variable before the constructor for identify map div in the HTML view. Add function for initializing Browser Geolocation, Google maps and places search by nearby. Create a function for displaying founded places markers that called from `initMap` function. That's it the basic Google maps and places initial that loaded places by nearby location with radius 1000 meters. Here we use browser geolocation to get the current geolocation latitude and longitude. We will move to use Ionic 3 Cordova Geolocation Native plugin when we test this app in the real Android/iOS devices. Now, you can test it on the browser. Just type this command again. 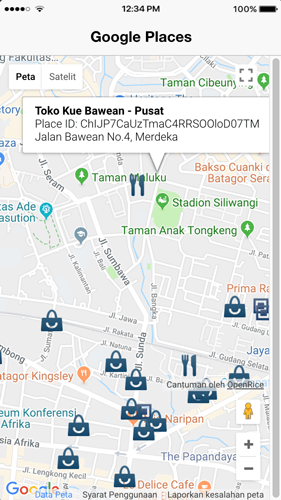 You will get the places with the type of `store` that nearby your current location. To change marker icon, open and edit `src/pages/home/home.ts` then modify `createMarker` function add this variable inside that function block. Add icon inside marker variable. To display details of the places that clicked from the marker. Simply change `infowindow.setContent` inside markers event listener. Now, you will see different marker icon and place details when you click the marker. 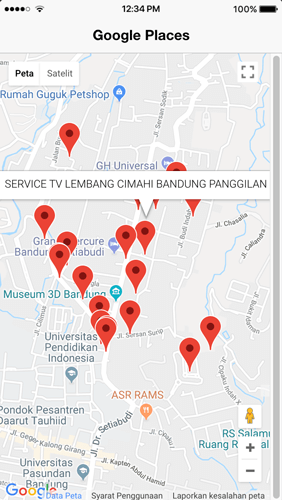 To make geolocation working on the device, you can use Ionic 3 Cordova Native Geolocation Plugin and here our tutorial. 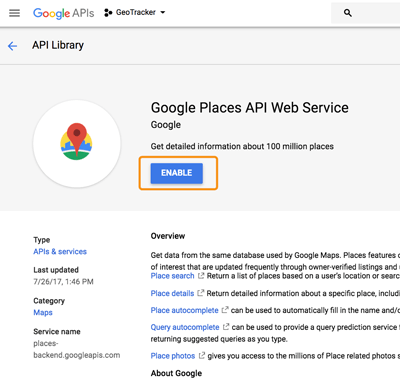 That it's, for the complete reference of Google Maps and Places APIs you can refer directly to Google official documentation here. This tutorial comes with full working source code from our GitHub.